We celebrated my brother-in-law’s birthday today. Just like all of us who’ve hit the 30-year club, each consecutive birthday is that much closer to 40, therefore making birthdays a bit painful. I won’t tell you how old he is, but I will say he’s closer to 35 than 30. Actually, I shouldn’t chuckle, since I’m only a year and a half behind him. Anyway, he’s not really a sweets person, so when I asked what kind of dessert he wanted to help celebrate his big day, he just said something that wasn’t too rich. 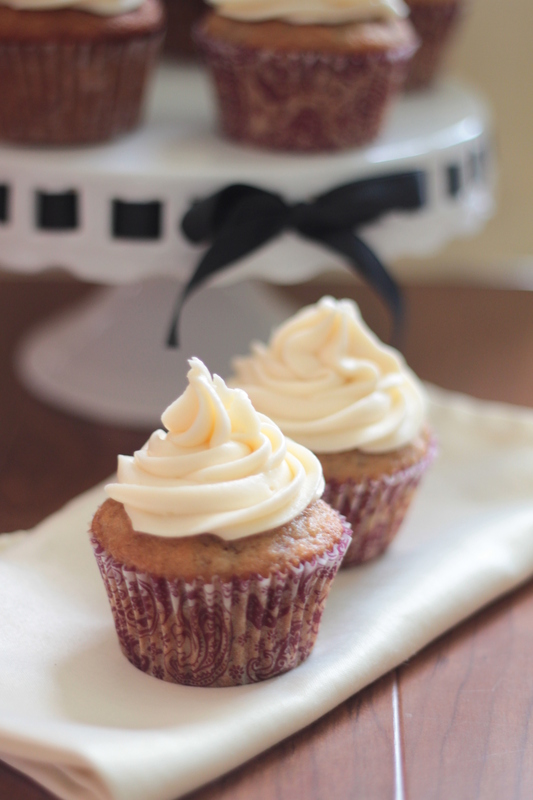 I decided on these cupcakes, partly because I had some bananas to get rid of. (You can read about my banana problem here and here.) But mostly it was because it’s the end of summer and the perfect dessert to kick off the fall. Preheat oven to 350. Line a muffin tin with cupcake liners. In a medium bowl, whisk flour, sugar, baking powder, baking soda, salt, and cinnamon. In a separate bowl, combine butter, mashed bananas, eggs, and vanilla. Make a well in the center of flour mixture and gently stir the wet ingredients until the flour mixture is fully incorporated. (Do not over mix!). Pour batter about 2/3 of the way full for each cupcake. Bake for 15-20 minutes, or until edges are golden brown and toothpick entered comes out clean. Transfer to a wire rack to cool completely. Beat butter and cream cheese with a mixer until light and fluffy, 2-3 minutes. Reduce speed to low and slowly add powdered sugar. Add vanilla. Beat on medium speed for 2 minutes, until velvety and smooth. Using a knife or piping bag, frost the cooled cupcakes. 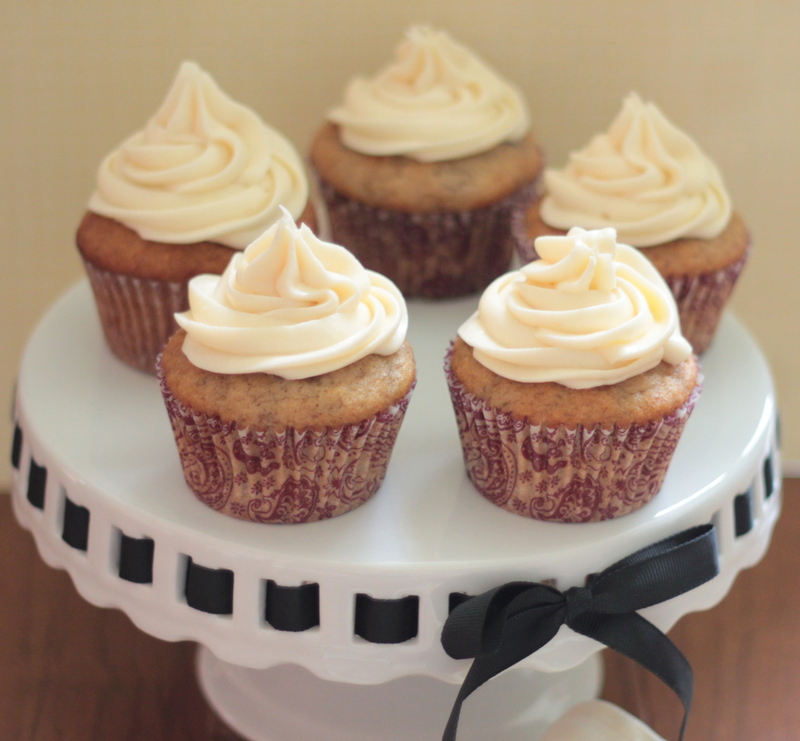 NOTE: Frosting can be refrigerated—bring to room temp and beat until smooth before frosting. SECOND NOTE: Cupcakes will be good for up to 3 days. Store any leftovers in the fridge. i am making 3 dozen of these tomorrow and the frosting tonight!! ill report back on the outcome but it sounds delicious cant wait to try them! Just made these a few minutes ago… They’re abolsolutely wonderful! Best baked good with banana in it that I’ve ever had! Thank you for the recipe! I’m celebrating 25th birthday every year ever since I turned 25..some x years ago. LOL. I figured this was I don’t have to keep counting. 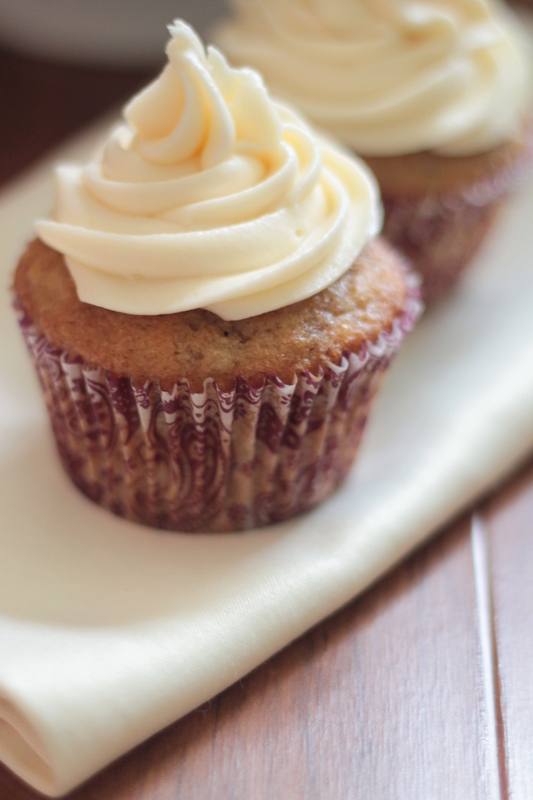 I love banana, and banana cupcakes are one of my favorites.